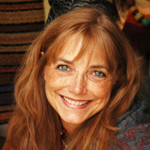 Karen Allen, actress and knitwear fiber artist (http://www.karenallen-fiberarts.com) contracted Lyme disease in the spring of 2002 in the Berkshire countryside while hiking. For the next year and a half she went from specialist to specialist trying to find someone who understood Lyme disease and knew how to treat it, but instead encountered the baffling reality that very few doctors know much about it and even those that do have no effective treatment. She was put on various antibiotic protocols, sometimes taking 2 and 3 different antibiotics at the same time along with anti-proisodals and medications she felt were making her feel worse and worse. Her symptoms continued to get worse and at a point when her doctor wanted her to begin IV antibiotics, she instead decided to stop all the medications and rethink how she wanted to move forward in treatment. She had seen acupuncturists, taken herbal remedies, tried colloidal silver, seen a cranial sacral practitioner, but none of these things had made a difference. She had contemplated going into hypothermia tanks, which some people with Lyme were trying, but the cost was prohibitive. She was at a crossroads and she felt the quality of her life was slipping away. Fortunately just at that time, a friend called with a suggestion that Karen go to see a local chiropractor who had a device known as a parasite zapper. She had heard it was having success in the treatment of Lyme. In the chiropractor’s office she was shown how to self administer the zapper to herself, which involves using an electrical device at a certain frequency to pass mild electrical pulses through the hands. Karen followed the instructions and worked with the device for four consecutive hours, left to return home not feeling particularly hopeful, and woke the next day to find herself symptom free for the first time in almost two years. She repeated the process two weeks later at the advice of the chiropractor, and purchased her own parasite zapper several weeks later from a web-site dedicated to Dr. Hulda Clark, a Canadian doctor who invented the zapper. Karen’s symptoms have never returned and she has used her experience to help treat dozens of people stricken with Lyme in the years since.